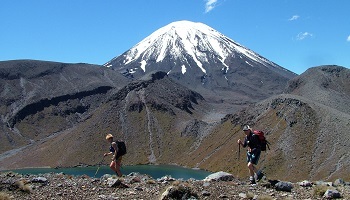 Make your way to Tongariro National Park where you will meet your guide for the 'Tongariro Crossing' with a small group of walkers. 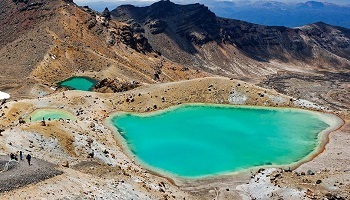 The traverse of the stark and spectacular volcanic terrain of Mount Tongariro is one of the most fascinating treks in the world. Among its highlights are steaming vents and hot springs, old lava flows, beautiful water-filled explosion craters and stunning views. On clear days you can see the 'perfect volcano' cone of Mount Taranaki to the west, as well as Mount Ngauruhoe, the Kaimanawa Range, Lake Taupo and beyond. 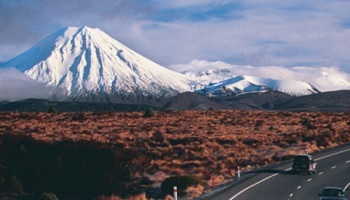 The mountains of Tongariro National Park are sacred to the Maori - tread carefully and with respect. The track is clearly way-marked but begins and ends at different points, so we will arrange return transport for you. This is trek over volcanic terrain and a reasonable level of fitness is required - it should take you between six and eight hours to complete.